Not for walls only, these rectangular building staples are catching on beneath the feet! Here’s why the multi-faceted material may deserve a place in your home. Brick, the hard-working earthen blocks basic to so many structures, is becoming a trendy flooring option for high-traffic interior spaces with connections to the outdoors. Think foyer, kitchen, laundry room, and mudroom—areas calling for visual impact that downplays tracked-in dirt. If you’re considering new flooring in such a space, read on to find out why a new breed of brick is a price-wise, easy-care option. 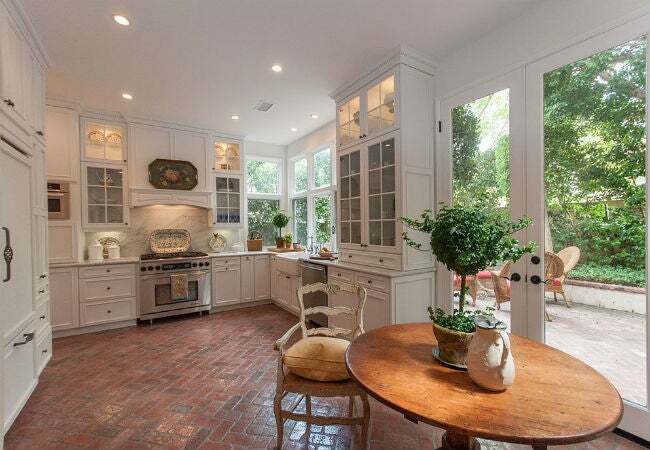 Then, get some tips for preserving brick floors’ natural beauty. Whereas solid or hollow bricks are commonly used on exteriors, interior brick floors generally consist of brick pavers or tiles: flat, 1-¼”- to 1-¾”-thick clay or salvaged brick material mounted either directly on the subfloor or on an underlayment above the subfloor like cement backerboard. These lightweight pavers or tiles range from $3 to $10 per square foot, in the same ballpark as ceramic tile ($2 to $5.50 per square foot) and at a lower starting price than natural stone ($5 to $10 per square foot). Budget an extra $3 to $5 per square foot for professional installation—less than what you can expect to pay for professional tile ($4 to $8 per square foot) or stone floor installation ($6 to $10 per square foot). Budget-conscious DIYers, keep in mind that the task generally entails leveling the subfloor, mounting an underlayment, applying mortar, and then laying down individual pavers. Eco-conscious homeowners are drawn to brick pavers and brick tile because their raw ingredients—clay, shale, and kaolin—are natural and reusable. Contrast this with vinyl flooring, made from synthetic polyvinyl chloride, or stone floors, a nonrenewable resource that requires vast amounts of energy to quarry. Reclaimed brick pavers or tiles, salvaged from old buildings, add a distressed look with historic relevance while reducing environmental waste. What’s more, unlike some traditional vinyl or laminate floors that emit high levels of VOCs (volatile organic compounds), planet-friendly bricks are free of pollutants and allergens, a plus for allergy-prone family members. Brick pavers or tiles can be laid in a number of traditional or bespoke configurations. Those with a classic aesthetic can opt for the “straight lay,” in which bricks interlock in a conventional grid pattern. 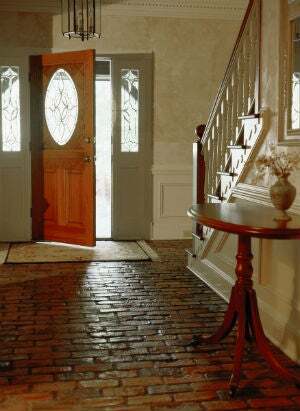 The “running bond” creates a simple offset motif while a basket-weave or herringbone pattern gives a more ornate effect to your brick floors. For something more modern, consider the V-shaped chevron. You can also pair brick with wood for a diamond inlay effect or even create a custom pattern. Brick pavers and tiles can also be painted for a more contemporary, less timeworn look. Even when wet, brick floors have an inherently rough and gritty texture that offers more traction than vinyl, laminate, tile, and non-textured stone flooring. Of course, brick will lose this non-slip quality with the application of glossy protective surface sealers, so consider leaving brick floors unfinished or use an anti-slip penetrating brick paver sealer (which sinks in and protects from below the surface) such as LastiSeal Penetrating Brick & Concrete Sealer. Fireproof, fade-proof, and rot-proof, brick can’t be beat for durability. It’s bound to last for decades without fear of damage from heavy foot traffic, sunlight exposure, weather fluctuations, or home fires. This sets brick floors apart from carpet, which is easily frayed or stained, or laminate floors, which can become warped by moisture and generally require replacement once damaged. In the rare event that a brick cracks, the modular nature of brick pavers and tiles make it easy to remove and replace. If you decide on brick floors for your home, preserve its beauty and prolong its life span with these floor care tips. • Vacuum with a dusting brush attachment or sweep with a broom or microfiber dust mop once a week to remove light dust and dirt. • Banish grease and grime on a quarterly basis by working a wet microfiber mop dipped in a solution of one cup of vinegar and a gallon of warm water into three-by-three-foot sections at a time. Before the solution dries, make a second pass over the wet section with a dry microfiber mop to pick up loosened grime and prevent white spotting. • Eliminate stains in mortar or grout around brick pavers or tiles by working a phosphoric acid cleaner (diluted with water according to manufacturer’s instructions) into the seams of the brick floors with a scrub brush. Perform this treatment as often as stains arise, but always in a well-ventilated room while wearing gloves. • If you sealed your brick floors, reseal them at the interval recommended by the manufacturer (anywhere from one to three years on average). First vacuum the floor and then removing old sealer with commercial brick paver stripper. Reapply fresh brick sealer to the entire floor (pavers and seams) with a foam brush. Keep in mind that because penetrating sealers don’t form a film on the brick, they retain the natural appearance and texture of brick better than surface sealers.